Yesterday 27th December is born in Genova: Pietro Invernizzi, son of Ines and Matteo. Pietro is our 49th member and (of course) the youngest in our kids-club. Many congratulations to very proud Ines and Matteo. 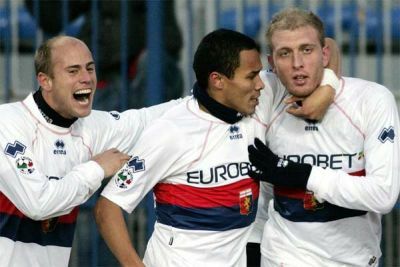 After 9 matches without a victory, Genoa has beaten Parma by 1-0. The Gasperini-boys played very good in defense and Rubinho was unemployed for the first 75 minutes of the game. In the 42nd minute Genoa got a penalty because Paci could not take his hands off the shirt of Borriello. Our topscorer himself scored the penalty, making his 8th goal of the season. In the hapiness Matteo Paro get injured by an elbow of Sculli who was a little too enthousiastic. In the second half the defense of Genoa was very strong, also in the air with De Rosa, Masiello and Santos. Parma only had 1 good shot on the goal, but Rubinho kept his goal clean. In the 94th minute substitute Papa Waigo scored the second goal of Genoa but he was in off-side so the final result was: 1-0. Like in a good Christmas-story the loved son returns at home. After 6 months with Juventus defender Domenico Criscito returns to Genoa. Sunday 30th december the born Napolitan that was raised in the youth of Genoa becomes 21 years. 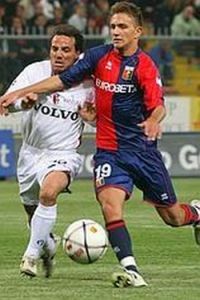 After 37 matches in Serie B with Genoa he had to leave his loved club last summer to go to Juventus, the team that already owns him for some years. Criscito was one of the hundreds of players that were bought by Moggi the last 10 years, so at the moment he became one of the best players in Serie B and the Italian team under 21 years Juventus wanted him back. After only 8 matches in Serie A and 1 in Coppa Italia with Juventus he returns to Genoa and Gasperini. Welcome back home Domenico ! Again Mr. Gasperini surprised everybody with his line-up. Scared for a new defeat he changed the usual offensive 3-4-3 system in a defensive 4-4-1-1. As usual it did not help, because without good defenders it is impossible to defend good, even if you put 9 defensive players in the team. In the first half Empoli hit te post twice and in the injury-time Giovinco scored the 1-0 lead behind Rubinho. After half-time Gasperini changed the system into 4-2-4 with the forwards: Leon, Borriello, Figueroa and Santos (central-defender in the first half). In the 55th minute Genoa deserved a penalty when Marzorati stopped Ivan Juric irregulary, but referee Giannoccaro didn’t whistle. At the end the fantastic mentality of the players gave Genoa the deserved goal in the 87th minute when Masiello shoot a perfect pass of Figueroa behind keeper Balli. In the last 8 minutes till the end-whistle in the 95th minute Empoli tried everything to change the score again, but this time we survived the last minutes. 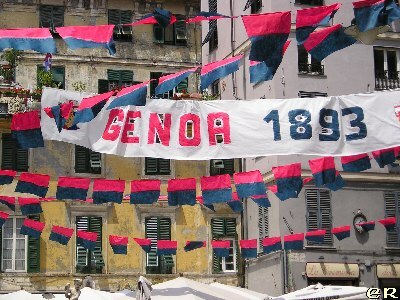 After all a correct result which kept Genoa on 15th position in the standings. Yeaterday-afternoon mr. Gasperini and his 21 players (everybody except the injured Danilo and Di Vaio) went by coach to Empoli, 25 kilometers west of Florence. The winter also has come to Italy, last night it was below zero in Toscany and during the match the expected temperature is 3 degrees, while it feels like -6 because of the wind. 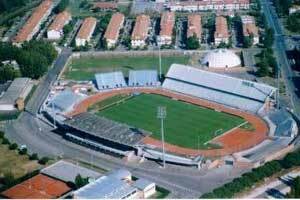 Over 2000 Genoa-fans, including 100 schoolkids, travel 228 kilometers to Empoli in Toscany next Sunday. After the defeat against Siena and the 4-1 victory of Empoli against Cagliari this match is very important for both teams. Genoa surely misses injured Danilo, while Cicco Bega returns after his penalty for his fourth yellow card. At the moment Fabiano and Di Vaio are injured, so it is not sure yet if they can play Sunday-afternoon.